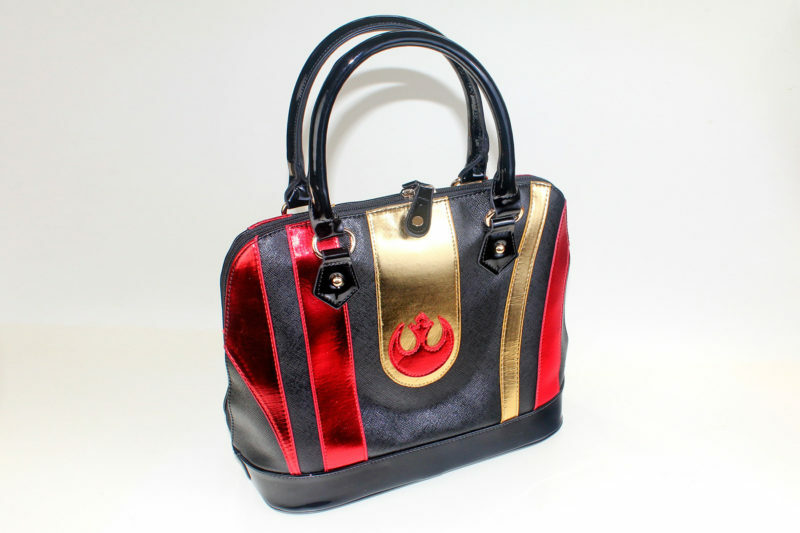 Today’s review features the Poe Dameron helmet dome handbag made by Bioworld. Released in August 2016, I instantly feel in love with the striking colours of this bag. The design is inspired by Poe’s Black Squadron helmet, which uses a black and red colour scheme. 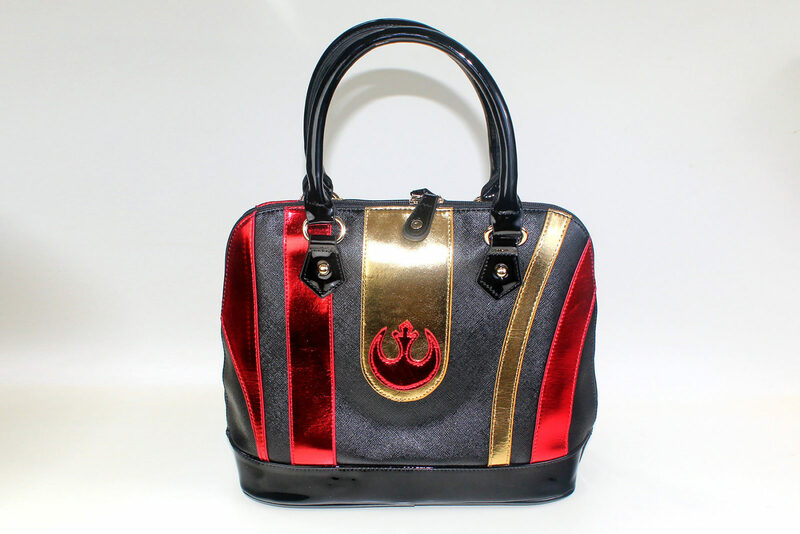 I own quite a few Dark Side themed handbags, so it is every exciting to have such a fabulous handbag for Rebel themed outfits too! 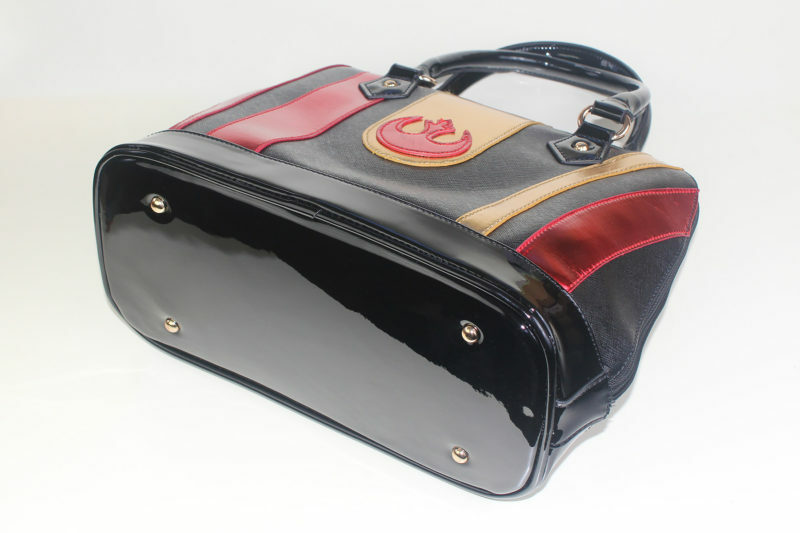 The bag is priced at US$30.59 to US$50.00 each, and is currently available from Bioworld stockists including Amazon and Entertainment Earth. The handbag is made from a black faux leather, which has a cross-hatch texture across the surface. 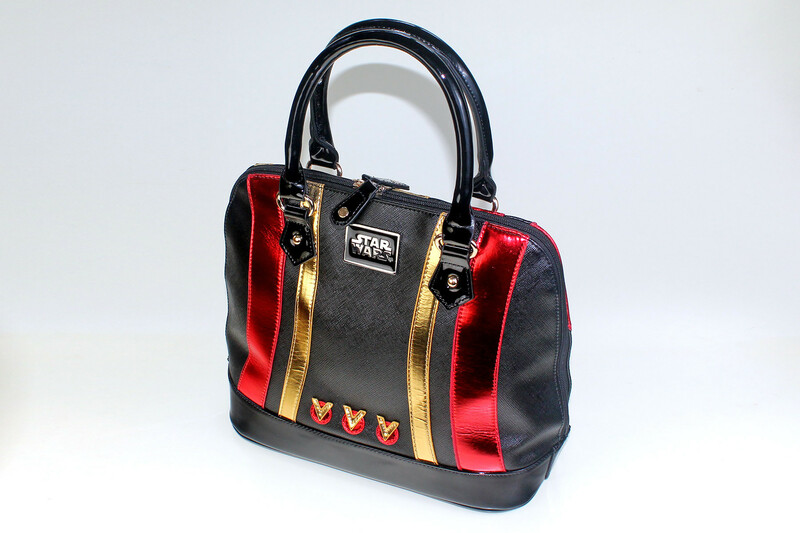 A gloss black patent faux leather is used for the handles and the bottom of the bag, while shiny red and gold metallic faux leather is used for the helmet design details. Even though the design is inspired by Poe Dameron’s helmet from The Force Awakens, the colour scheme reminded me of Queen Amidala. 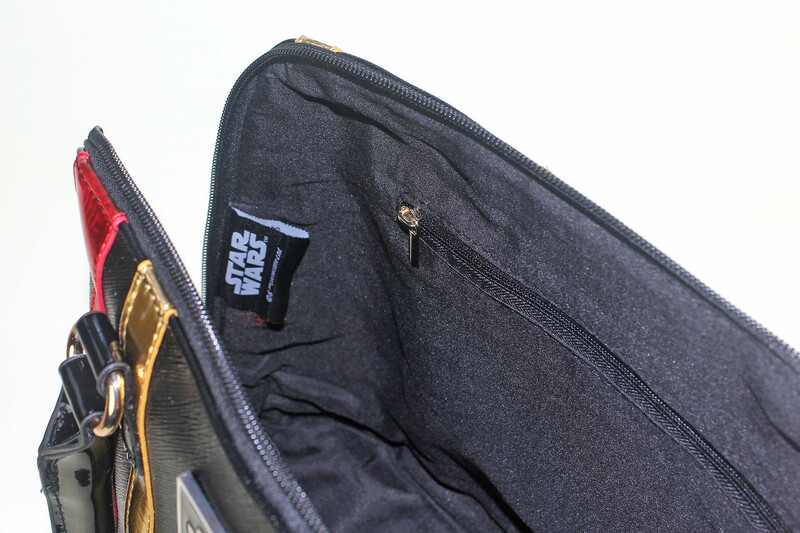 Poe’s helmet design includes grey and yellow sections – the bag uses gold for these details instead. The front metallic faux leather design is asymmetrical, while the back is symmetrical. 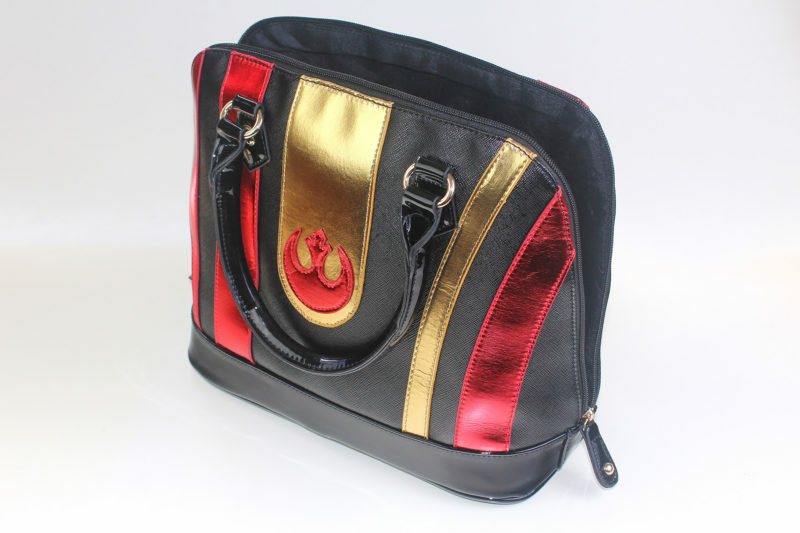 This is my first Bioworld dome handbag – earlier designs included the silver/black Stormtrooper dome bag, and more recently the Jyn Erso dome bag. I was really interested to see just how large this bag is in person – it is a great size for carrying everything I need. The handbag measures approximately 33cm across, 15cm wide, and 26.5cm high (measured straight). While I can technically wear this on my shoulder, it is not really designed for it – it is better carried by hand or hung at your elbow. The handles have an approximate 16cm drop (measured straight from the ring attachments). 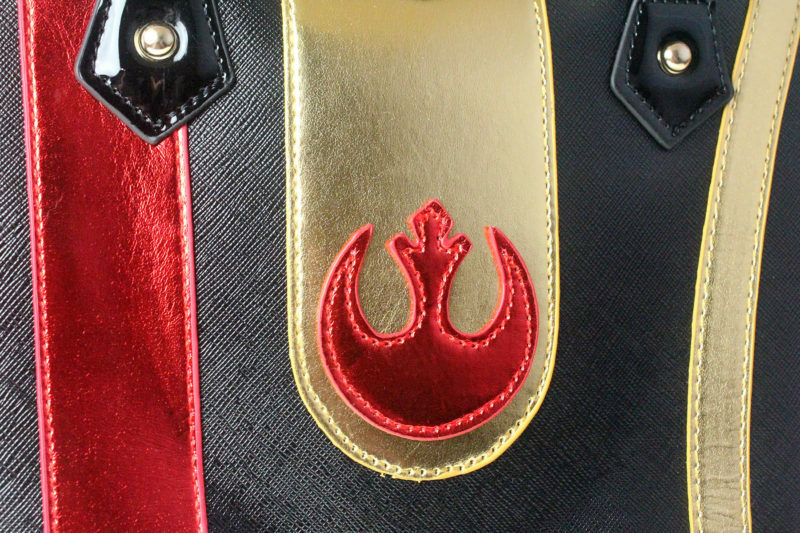 The front of the handbag features the classic Rebel Alliance ‘starbird’ symbol, which originated in A New Hope, but is later used by the Resistance in The Force Awakens. 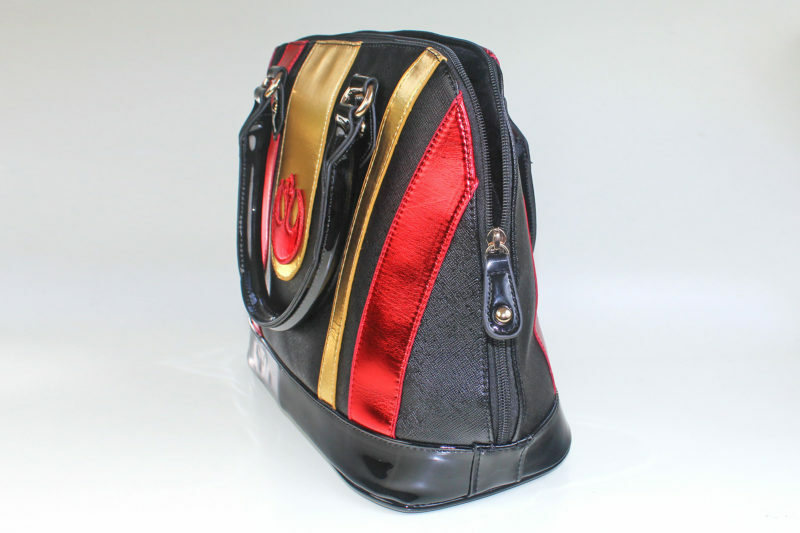 The symbol is cut from red metallic faux leather, and top stitched on top of the central gold faux leather panel. All of the edges of the metallic faux leather detail panels have a coating to protect the edge, which gives a nice finished appearance, rather than a raw edge. The top stitching is all done in colour-matched gold or red thread. 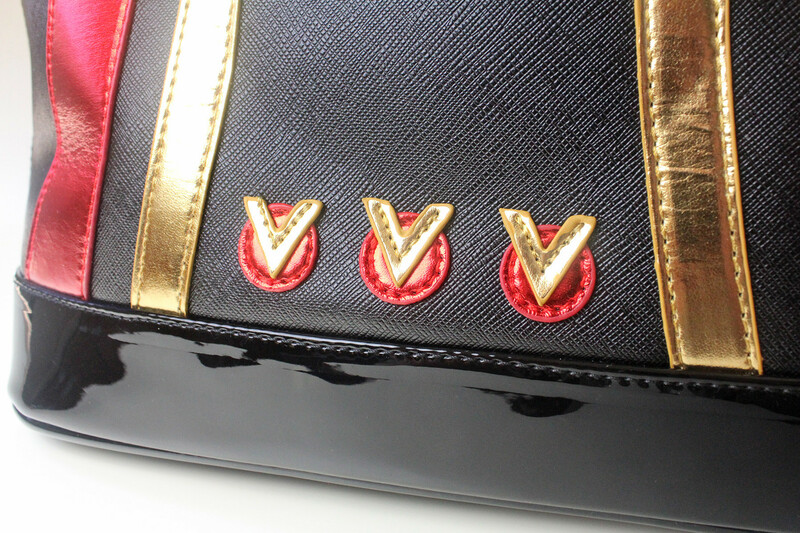 The back of the handbag features 3 small symbols on the bottom, which look like a gold ‘V’ on top of a red circle. These symbols appear on the side of Poe’s helmet, and again, they originally appeared on X-Wing pilot helmets (like the one worn by Luke Skywalker) in A New Hope. 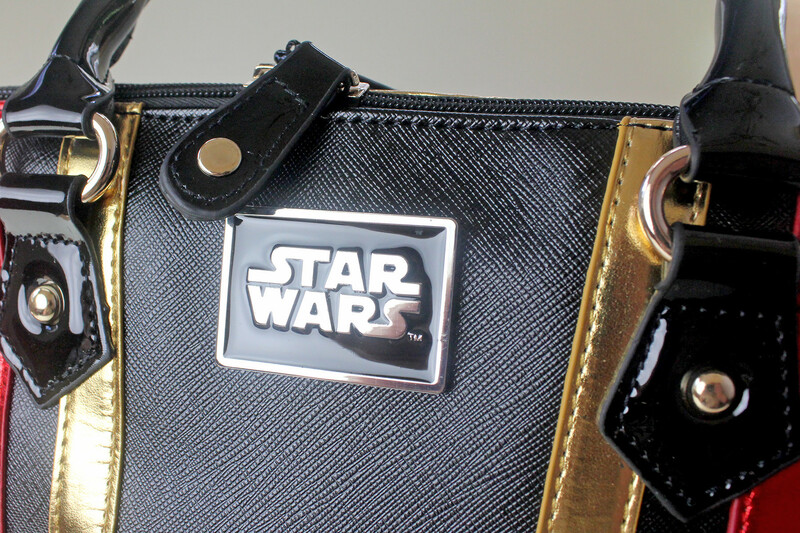 The upper back of the bag also features a silver-tone metal plaque of the Star Wars logo, accented with black enamel. 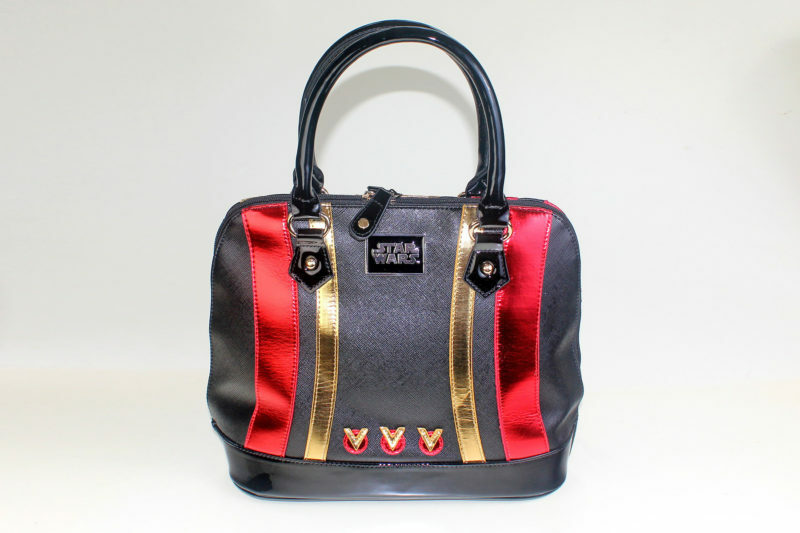 The bag features gold-tone hardware, such as the handle fixtures and rivets. It is slightly paler gold, as it can appear almost silver in some light. I love the sturdy feel of the rings used for the handles. The full length top zip allows easy access to the interior, which is really helpful in rigid-shape handbags. 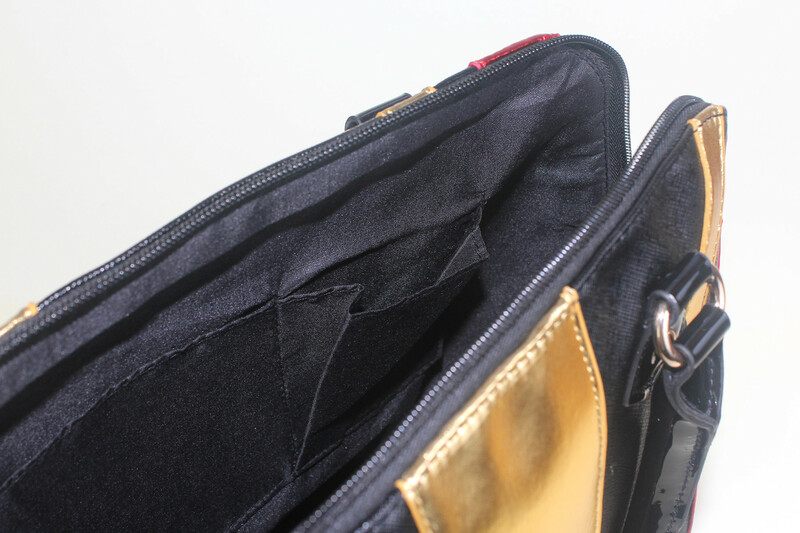 The top black plastic zip features gold-tone zipper pulls, with black vinyl tabs. These tabs are a great ‘thumb grasp’ size, with a neat gold-tone dome rivet accent that matches the rivets used for the handle attachments. Inside the bag is lined with black polyester lining fabric. 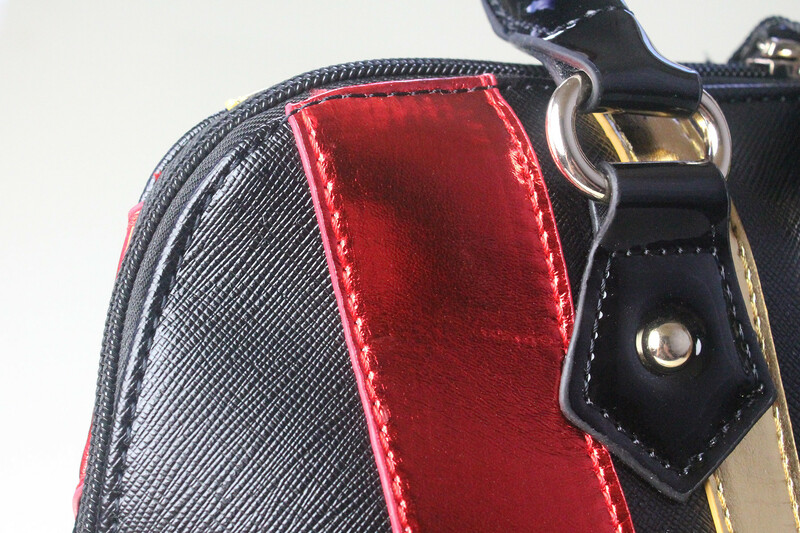 One side features a zip-up pocket with a small metal zipper pull, while the other side features 2 open pockets. There is also a black fabric tag inside, featuring the Star Wars logo and standard Lucasfilm copyright text, noting this is a licensed item. This bag is large enough to fit everything I need, plus a small cardigan – it can even fit my iPad easily. While the sides of the bag are rigid, they can flex and bend. This can put small creases through the metallic faux leather panels on the outside, but it gives the appearance of leather when it creases, and doesn’t detract too much from the overall appearance. Considering the original design inspiration is a battle-worn helmet, it looks more Poe Dameron inspired the more you use it and ‘wear it in’. There is a gloss black patent faux leather band around the bottom of the bag, which measures approximately 3.5cm high. The bottom of the bag is made from the same black patent faux leather, with four gold-tone metal stud feet, to avoid scuffing the surface when placed down. For those who may be curious, here is a size comparison picture of the Bioworld dome bag with the Loungefly BB-8 mini dome bag. As you can see, the Bioworld bag is a fair bit larger than the Loungefly bag – I love both of these bags, and use them often. 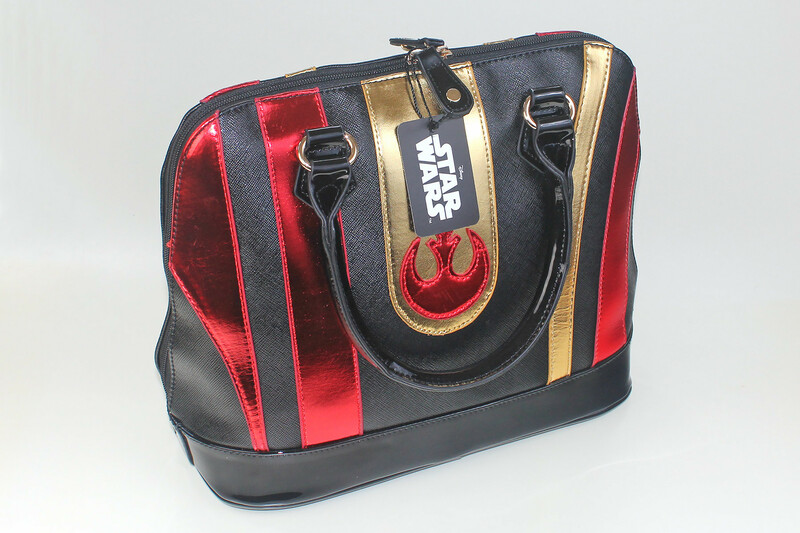 It is great to have different sized handbags for different occasions, and I hope to see many more Bioworld x Star Wars dome bag designs in the future. 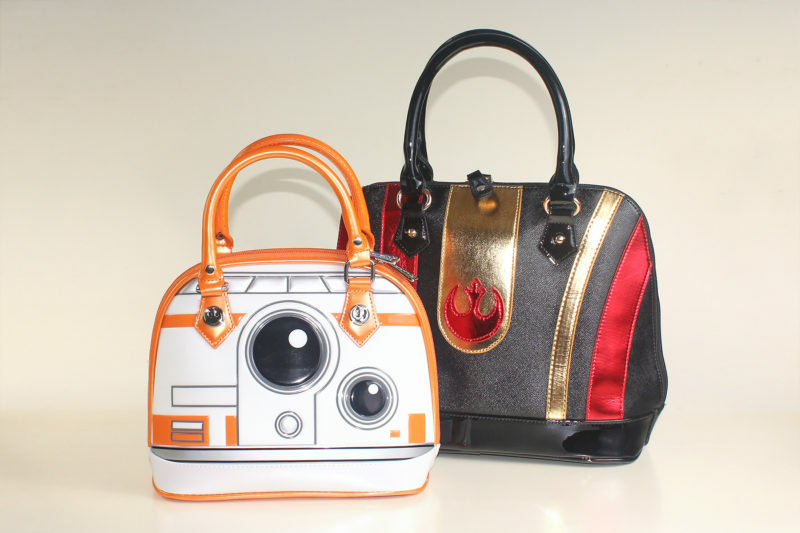 Bioworld recently released a photo of a matching Poe Dameron wallet – I definitely need it to match this fabulous bag!